For the second time in a row DC Comics are proud to present another new app for you to download onto your mobile devices. 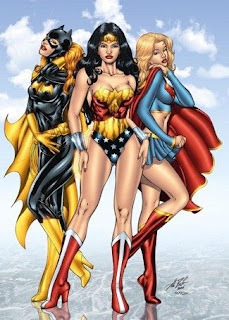 This time though, the app in question belongs to the DC Super Hero Girls, a all-female group featuring such iconic DC characters as Wonder, Woman, Supergirl, Batgirl, Harley Quinn, Bumblebee, Poison Ivy, Katana, plus many-many more. It's easy-to-use “swipe and play” system allows the user to be transported to the action-packed setting of Super Hero High, where they can play mini-games, watch videos, dress up their favorite heroes, customize photos, and learn more about their much beloved gal-pals. On top of that, they'll also be able to get regular updates and unlock regular content to earn points and tokens to use within the app. Want to know more? Then click the download link provided. Just after you watch these clips from DC All Access. Son of Krypton verses Bat of Gotham is only the latest bone-crunching battle featuring the Man of Steel! Over the years, Superman has gone toe-to-toe with some of the most powerful people in the universe. From Darkseid to Doomsday to Muhammad Ali, here, this is a Top 10 Superman fight list of all time. Do you want to know more about Batman? Yeah. Sure you do. In this clip our Tiffany talks to Batman v Superman: Dawn of Justice director, Zack Snyder, about bringing Batman to the big screen. Then Batman writer Scott Snyder teases us about issue #50, which features Bruce Wayne's long-awaited return to the cowl. Plus on top of that, we also run down this week's DC news, and give fans a chance to win a jaw-dropping set of Batman v Superman statues from DC Collectibles! Batman v Superman: Dawn of Justice is finally here. But before you head to the multiplex and watch it, don't miss this new DC All Access movies clip featuring Ben Affleck, Henry Cavill, Gal Gadot, Jesse Eisenberg, Amy Adams, Diane Lane, Holly Hunter, and Laurence Fishburne offering insights and sharing secrets about their characters. Come, let's go behind the scenes with Melissa Benoist and Grant Gustin as the two #DCTV superstars share scenes and insights from March 28th's spectacular Supergirl / Flash crossover episode. Robin gets a new storyline, villain, and writer in this months new issue of Robin: Son of Batman. So in this clip, Tiffany talks with Ray Fawkes about joining the series and how the next few issues represent a pivotal point in Damian Wayne's career and life. Tiffany and Jason are back with an all new episode of DC All Access, and this time they are talking about props! Or to be more specific about it, they'll be talking to Batman v Superman prop master, Doug Harlocker, who'll give them an exclusive look at Batman’s latest gadgets. Plus, we round up some of this week’s noteworthy new releases before wrapping up by giving a lucky fan the chance to win an amazing Batman ’66 Batcave LEGO set! Wonder Woman has made her silver screen debut in Batman v Superman: Dawn of Justice, and she's definitely a pop culture icon to be admired. But, prey tell, where does she rank in the entirety of the ladies of the DC Universe? Click to find out.